Now that I’ve finished reading and reviewing Emma Chase’s Legal Briefs series (Overruled, Sustained, Appealed), I’ve decided to read and review the rest of the Lunar Chronicles basically back-to-back-to-back. 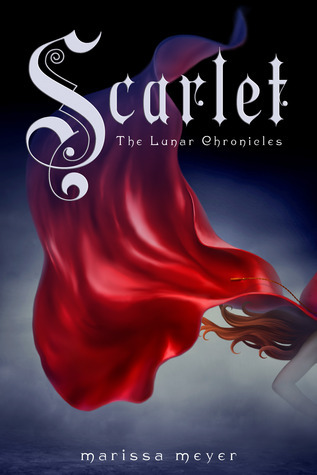 Admittedly, I originally thought about doing that when I read and reviewed Cinder back in January, but I ultimately decided to hold off on doing that since I wanted to do the same thing with the Legal Briefs series; that being said, here are my thoughts on Scarlet. Right off the bat, I have to admit that while I loved Scarlet, this book ended up being very different from the way I was expecting it to be. I was really expecting the titular Scarlet Benoit to be featured in this book front and center with her being the protagonist of the book, and Wolf basically being the co-lead character of the book. However, this book ultimately ended up feeling like more of an ensemble piece than anything else. That definitely really took me by surprise as I was reading it. While I’ve always thought that three of the most important tasks that the first book in a series is supposed to accomplish is to introduce the main characters, introduce the premise of the series, as well as establish the status quo for the series; I feel like this book did a much better job of establishing what I can expect from the Lunar Chronicles as a whole. Sure, Cinder did a great job of introducing the characters Cinder, Kai and Queen Levana, as well as various aspects of the series such as how the characters are dealing with the threat of the letumosis plague; but as I said, I was originally expecting each book in the series to focus primarily on a different character, with the characters from the previous books being featured in a rather reduced capacity. However, Scarlet really ended up coming across as an ensemble novel that focused on a variety of characters instead of focusing primarily on Scarlet, along with Wolf. Here’s a promo for next week’s episode, episode 6×17 “Bomb Voyage”. Here’s an extended promo for next week’s episode, episode 3×11 “Bouncing Back”. Here’s a promo for next week’s episode, episode 1×09 “Rise Up”. Here’s a promo for next week’s episode, episode 6×19 “Did You Miss Me?”. Here’s an extended promo for next week’s episode, episode 2×14 “Chapter Thirty-Six”. Here’s a promo for next week’s episode, episode 1×12 “Scientists Hollow Fortune”. Here’s a promo for next week’s episode, episode 8×14 “The G.D.S.”. Here’s a promo for next week’s episode, episode 1×08 “The Strangled Heart”. Here’s a promo for next week’s episode, episode 1×07 “Wingman”.